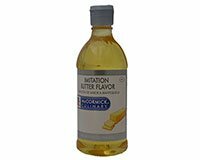 McCormick Imitation Butter Flavor adds the flavor of butter to many recipes without adding fat. However, keep in mind that in many recipes the fat is required including cookies, cakes and breads. Add 1/4 tsp to water when cooking vegetables for butter flavor. Use McCormick Imitation Butter Flavor to add the rich flavor of butter to mashed potatoes, vegetables, creamed soups, steamed rice, frostings, grits, hot cereals and homemade ice cream. Ingredients: Soybean Oil, Natural and Artificial Flavors, and Lactic Acid. Add 1/4 tsp of Imitation Butter Flavor to the water when preparing a 10 ounce package of frozen vegetables.